Every good market has a competent leader and an equally strong player who would trail closely in the second position. There are examples of Coke and Pepsi in bottled drinks market, Canon and Nikon in the camera market, etc. The same is true for logo design contest websites. The two biggest players in this market are 99designs and 48hourslogo. The „logo design“ niche has its list of top companies competing for the top spot when it comes to being the best in this category. There are a number of companies out there offering this type of service, but we can focus on the two well-known players in the market: 99designs and 48hourslogo. Out of the two choices, it seems that the most popular site for holding a logo design concept is 99designs. If you Google for keywords such as „logo design“ or „logo design contest“, the company 99designs comes first in the Google search results. It is easy to assume that in terms of popularity, 99designs is a lot more famous than 48hourslogo. But is 99designs also the best place to get your new logo designed? From my experience, it was the contrary. I have hosted many logo designs on both these sites and after having understood both their capabilities and problems, I decided to use 48hourslogo for all my future logo design contests. 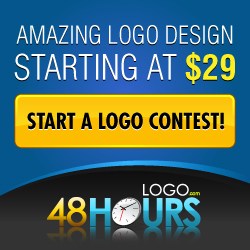 Whereas with 48hourslogo you can start your logo design contest from $128 and go as high as your budget allows. A limited budget is not the only concern. Setting a price for your logo design contest can be very tricky. You probably think that the more money you pay, the better logo design you get. Sadly, this is not true. Following analogy will help you understand this better. An experiment was conducted in a company. Employees were divided into 2 separate groups and each group was asked to create a presentation for a company’s new product. There was one major difference. One group was told that if their presentation won, each member would receive a bonus that matched their monthly salary. The second group wasn’t offered any kind of incentive before the contest began. You can probably guess who won. The first group of employees had a big $$$ before their eyes that somehow blocked the creativity of the employees‘minds. No matter how hard they tried, they always focused on money instead of the work itself. It is also a known fact that monetary goals decrease cooperation within team members and increase use of malicious tactics and fraud in order to achieve such monetary goals. The second group, not knowing about the huge bonus offered to the first group, worked on the design with only the honor of winning the competition in mind. At the end of the competition, the boss decided to reveal the bonus compensation to the second group as well. The second group was pleasantly surprised when the boss offered them the bonus at the end of the contest. The difference was that the compensation was offered after the work was done and the contest was won. With this experiment, one can clearly see how the small difference of letting somebody know of the prize early on can make a significant change on how the result will end up. But what does this have to do with the pricing in a logo design contest? It is literally throwing everything against the wall, only to wait and see if something sticks. Simply put, the more you pay, the more unwanted logo designs you get. But it doesn’t end there. If you dare to pay gold ($799) or God forbid platinum ($1199) package on 99desings, you will be spammed with hundreds of pictures that are very far from being a logo. Having said these, let’s get to the second reason why 48hourslogo is better. When you hold a contest for logo design you are paying for creativity. You are paying for an original logo which shows the values and tenets of your brand/ product. Knowing this, you have to take extreme caution not to end with buying “a pig in a poke”- a copied logo without a bit of creativity put to the design. With 99designs, you need to look closely into each of the submitted designs to make sure that what you have in front of you is something created uniquely for you, something that was created with your company/brand in mind and not just a copied piece of “art”. 3. Being the most popular, 99desings attracts more amateur and copycat designers than skilled artists. What is the minimum price I can win? Are there enough contests to spam my designs with? 99designs does not have any screening processes in place to separate skilled artists from the bad ones. This means that anyone can join the already enormous group of logo designers. These designers can immediately pick up a contest and start submitting their own logo designs. There is nothing to stop them despite lacking the creativity or talent to create the design or logo for the contest. The quality of designers available with 48hourslogo can be judged by the fact that they have an overall customer rating of 4.9 out of 5. 48hourslogo requires each designer to undergo a design assignment before they are allowed to participate in any logo design contest. Hopefully, these 3 reasons should be enough to make you think twice where you decide to host your next logo contest. Remember that popularity doesn’t equate to being the best at all times. There are times when you need not pay as much in order to get the best quality you are looking for. Sometimes the second most popular one may be the smartest choice.